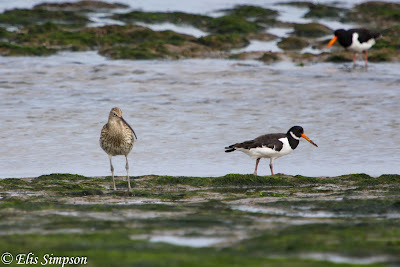 Wader Quest: Oystercatchers of the world. Pt 1: The black-and-white ones. Oystercatchers of the world. Pt 1: The black-and-white ones. 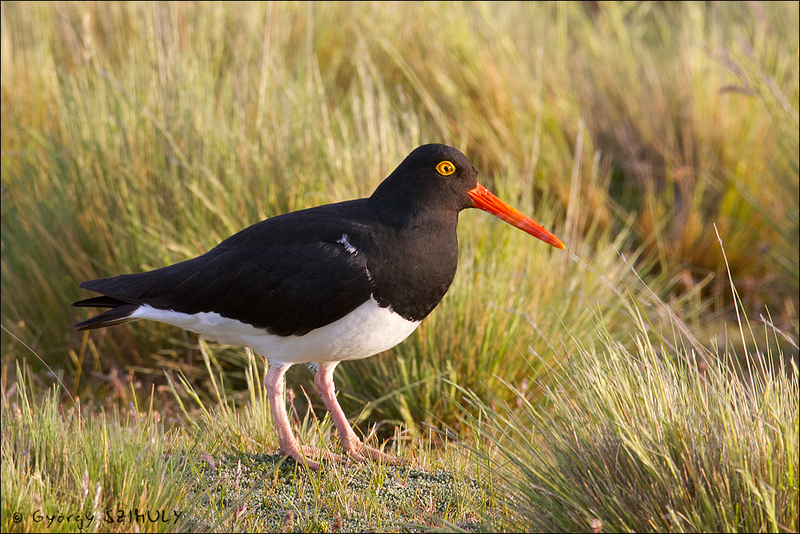 There are twelve species of oystercatcher around the world and they all belong to the genus Haematopus. One of them, Canarian Black Oystercatcher H. meadewaldoi, is extinct, another the Chatham Islands Oystercatcher H. chathamensis is endangered and another the African Black Oystercatcher H. moquini is near-threatened according to the IUCN Red data list. 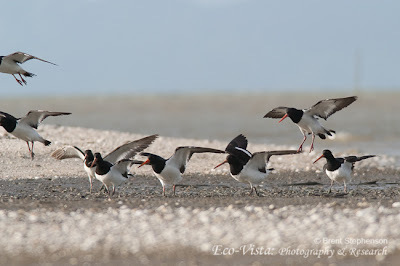 Eurasian Oystercatchers: Bangor, Gwynedd, Wales, September 2012. Of the twelve species, five fall into the 'black oystercatcher' camp, six into the 'black-and-white osystercatcher' camp and one, the Variable Oystercatcher H. unicolor seems to have a foot on both camps. For the purposes of this blog we'll include the latter in the next blog with the black oystercathers. American Oystercatcher: Tavares, Rio grande do Sul, Brazil, June 2011. The classic black-and-white oystercatchers all look very similar and vary mostly in their bare part colouration, wing bars and back colour. The most widespread of them is the Eurasian Oystercatcher H. ostralegus. In the UK and north-west Europe this bird is resident in that it can be seen year round, but the species is mainly migratory and the population in this region changes with the seasons. It is a breeding visitor in Iceland and across the rest of northern Europe and Scandinavia and into western Russia These birds pass the boreal winter in southern Europe, Africa - basically north of the equator and across Asia to India. There is a separate eastern population that breeds in the Kamchatka Peninsula and China that winters in eastern China. Previously another subspecies was involved H. o. finschi but that is now considered to be a separate species and treated as such by us (see below). Adult breeding Eurasian Oystercatcher: Snettisham, Norfolk, England, March 2012. Note the red eye, red orbital ring, black back and pink legs. First winter Eurasian Oystercatcher: Titchwell, Norfolk, England, November 2012. Note the brownish back (compared to the adult bird behind), the white collar dark-tipped bill and paler legs. (With Eurasian Curlew Numenius arquarta). Eurasian Oystercatchers: Bangor, Gwynedd, Wales, September 2012. Note in flight the white wing bar extending extensively into the primaries, this is unique to the Eurasian among the black-and-white oystercatchers. Adult breeding and first winter Eurasian Oystercatchers: Snettisham, Norfolk, England, March 2012. In the first winter bird note the duller orbital ring, paler dark-tipped bill, brownish back and white collar. The latter feature is shared with adult non-breeding birds. Adult breeding Eurasian Oystercatcher: Titchwell, Norfolk, England, June 2012. There are three subspecies involved; H. o. ostralegus in western Europe, H. o. longipes in western Russia and H. o. osculans the eastern population in eatsern Russia and China. On Wader Quest we have only seen this bird in the UK where H. o. ostralegus would be seen and the UAE where the subspecies would probably be H. o. longipes. Flock of Euraisan Oystercatchers at high tide roost with Red Knot Calidris canutus: Snettisham, Norfolk, England, March 2013. Pied Oystercatcher breeds mostly around the southern and eastern coasts of Australia. 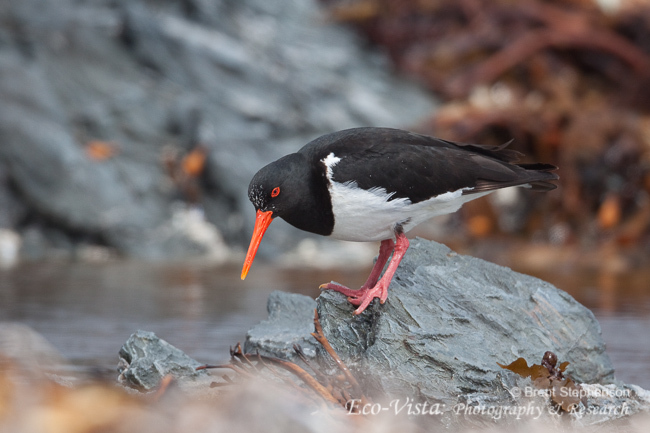 with small population dotted around the north where it is more widely encountered as a winter visitor, it is the only black-and-white oystercatcher in Australia and is monotypic. This we should see on our future Wader Quest trip to Australasia although we did see them previously in Western Australia in 2004. Pied Oystercatcher: Shark Bay, Western Australia, Australia, October 2004. The bare part colouration is similar to that of Eurasian Oystercatcher. In flight they show no white on the primaries, the white on the back does not extend as far up the back being squared off rather than in a v shape and the back is black. 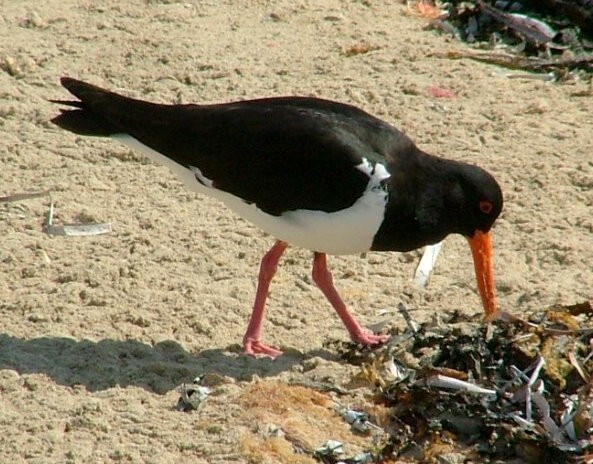 This species does not show the white collar of non-breeding Eurasian Oystercatcher. New Zealand holds two black-and-white oystercatcher species H. chathamensis and South Island Pied Oystercatcher H. finschi and a third that is occasionally black-and-white, the Variable Oystercatcher H. unicolor which we have treated as one of the 'black ostercatchers' that will be dealt with in the part 2 of this blog. The Chatham Island species is confined to the Chatham Island group of islands to the east of New Zealand. This species is endangered but its population has responded to conservation efforts resulting in an increase in numbers. However it is such a small population that it remains in a precarious position. We will not be seeing this species on our travels for Wader Quest. Chatham Oystercatcher: Chatham Islands, location and date unknown. Photo by Brent Stephenson. The black on this species is more extensive on the breast than South Island Pied. Chatham Oystercatcher: British Natural History Museum Lond, Tring bird collection. Note the mottled transition between whiteand black on the breast. Photo Elis Simpson. The South Island Pied Oystercatcher was, as mentioned before, considered a subspecies of Eurasian Oystercatcher. It breeds on South Island in New Zealand and winters both there and in North Island. This is a bird that we definitely do hope to see on our stay in New Zealand. South Island Pied Oystercatchers: New Zealand exact location and date unknown. Photo by Brent Stephenson. Note that although this photo doesn't show this, the wingbar and amount of white on the back separate this from Pied. Pied has shorter white bars in the wing that don't reach either the inner seconaries or the primaries, and the white doesn't extend so far up the back to a point. Hopping across the Pacific we come across the final two species in this group. The widespread American Oystercatcher H. palliatus has two subspecies H. p. palliatus that is resident along the Pacific coast south from the Gulf of California to central Chile and on the Atlantic north-east USA down to central Argentina and H. p. galapagensis which is restricted to the Galapagos Islands. 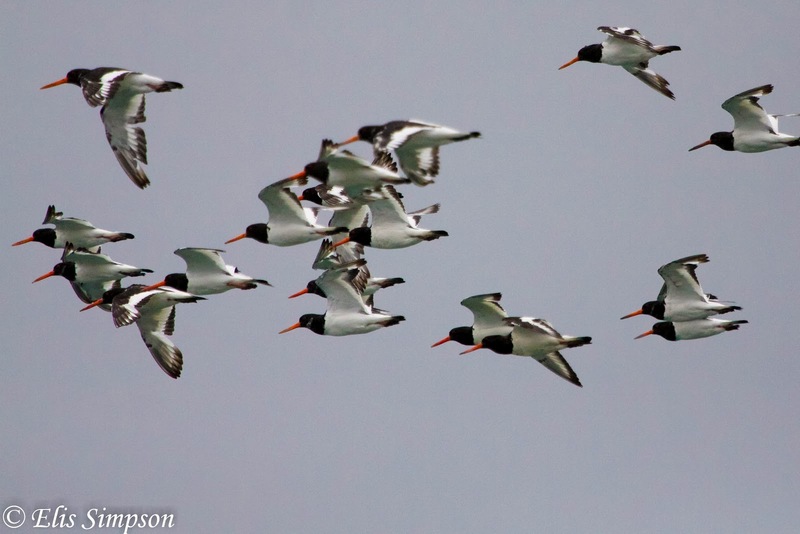 American Oystercatchers in flight: Tavares, Rio Grande do Sul, Brazil, June 2011. Note the short wing bar with little or no white on the primaries and the lack of white on the lower back which is brownish. American Oystercatcher: Villa Marshes, Lima, Peru. May 2013. Note the yellow eye and red orbital ring. American Oystercatcher: Villa Marshes, Lima, Peru, June 2013. Note the pale fleshy-pink legs. American Oystercatcher: Tavares, Rio Grande do Sul, Brazil. June 2011. The contrast between head colour and back colour can be seen well here. 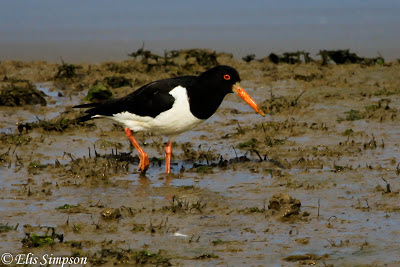 American Oystercatcher: Milford, Connecticut, USA, May 2012. This bird shows quite well defined white marks on the inner primaries but compare with the extensive white wing bar of Eurasia Oystercatcher above. We have seen this species in two places now on Wader Quest, in Louisiana in the USA and Lima in Peru. We quite expect that we'll come across more in Brazil and Chile later in the year but we won't be going to Galapagos, so that subspecies will remain unseen. American Oystercatchers in typical beach habitat: Villa Marshes, Lima, Peru, June 2013. 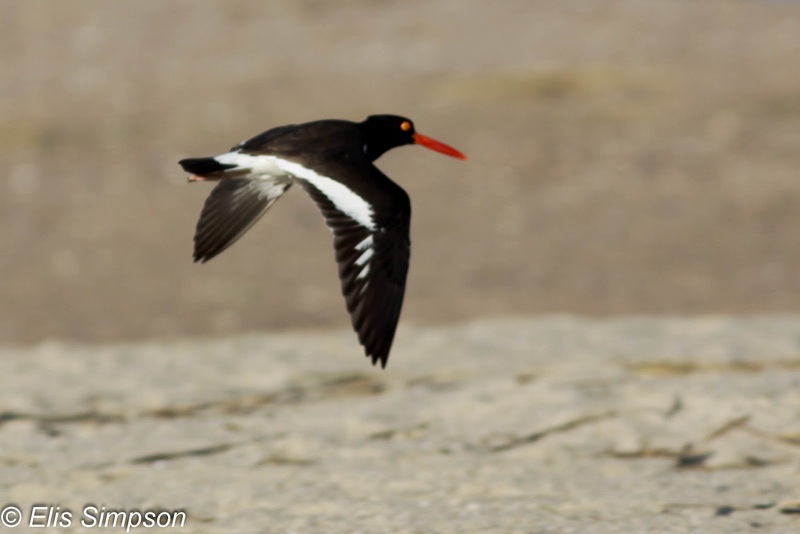 The other south American balck-and-white oystercatcher is the Magellanic Oystercatcher. This has a much more restricted range and more or less replaces American Oystercatcher at the tip of the southern cone of South America. This bird we will be searching for on our trip to Chile later this year when we hope to be flying down to Punta Arenas and Tierra del Fuego in search of this and other restricted range waders of the region. Magellanic Oystercatcher: Punta Arenas, Chile, November 2005. Photo Gyorgy Szimuly. Note yellow orbital ring and eye making this species very distinctive. The back colour also fiffers from American Oystercatcher in that it is black matching the head. The Magellanic Oystercatcher has a typical head down display like other oystercatchers, but unlike the others it also has a peculiar tail-up action too. Has anyone made a study of how such a species became worldwide, forming different subspecies but retaining its fundamental features and recognisability as an oystercatcher. The spread cannot surely have occurred far back in time. I dare say they have, but I have not seen it. It is a curious situation a bit akin to that of the Black-winged Stilt, where black and white birds have evolved into all black species (one in the case of stilts 5 in the case of oystercatchers). 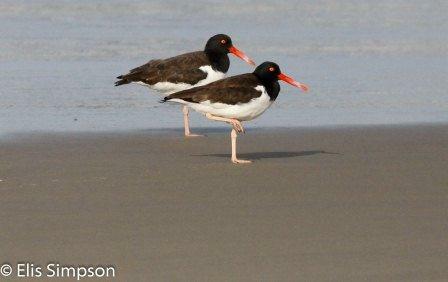 It is thought that Oystercatchers evolved on Gondwanaland and separated with the continents. This is suggested by the majority of species lying in the southern hemisphere.